After the return trip from Palm Springs, I realized I had reached home "just in time" for some critical maintenance. Before the trip I made sure all the maintenance was current and even had my mechanic go over the plane in detail. Until the very last leg of the journey, everything was working flawlessly. However, the last hour wasn't so pleasant. For starters, the A/C stopped working. I know... I know ... hardly a crisis ... But it was Florida and rather warm out. No worries, I pressed on. Then a funny engine indicator popped up on the R9. The Turbo Inlet Temperature spiked to 2000 degrees! Yikes... I had never seen this before! But surprisingly, everything else was looking, sounding and feeling normal. Since I was less than 100 miles from home, I reduced power to about 50% and stared at the engine indicators the rest of the way. I suspected a minor sensor problem because the turbo temp was fluctuating ~ 500 degrees up and down in a matter of seconds. But I wouldn't know for sure till I was on the ground and the cowling was off. 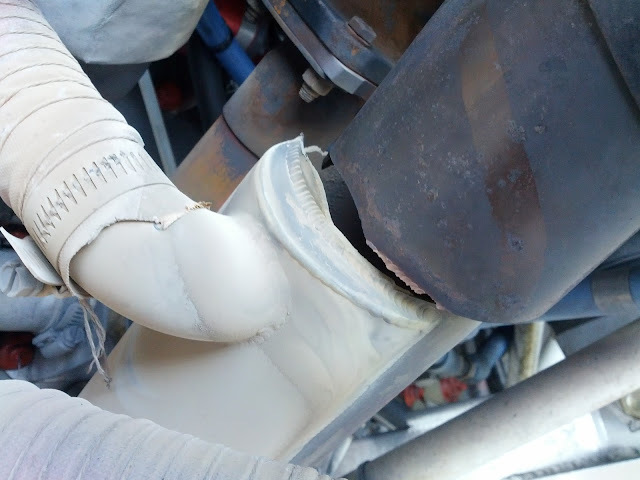 There was not just a crack, but rather a serious separation in one of the exhaust pipes. This could have been quite unpleasant for me at some point really soon. So I was glad that the sensor problem uncovered this! I am even more pleased about how lucky I was that this didn't cause a more serious issue during my long journey. Now after a week, everything is fixed and the plane is back in the air... Time to plan the next journey! !